Moon and planets #1Courtesy Mark RyanWhen I was a kid I remember my dad would like to point out that the word "syzygy" was one of very few multi-syllabic words that didn't contain any of the "normal" vowels. 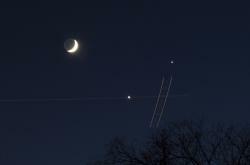 Moon and planets #2Courtesy Mark RyanThe definition in an astronomical sense is when three or more celestial bodies in the same gravitational system line up in essentially a straight line. One example would be the Sun, Moon, and Earth during an eclipse. 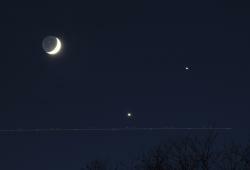 Another may be the phenomenon that was visible in the western sky just after dusk today. Moon and planets #3Courtesy Makr RyanHere are four photographs I shot of the alignment of the Moon with the planets Jupiter and Venus. I don't know if the celestial alignment is technically a syzgy but the word has stuck with me and I'm still waiting to use it in a game of Scrabble. 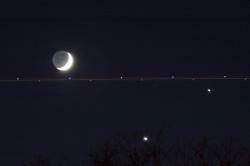 Moon and planets #4Courtesy Mark RyanPLEASE NOTE: From my vantage point the event was happening right in a flight path for the Minneapolis-St. Paul airport so aircraft kept flying through the frame. That's what all the streaks and extra lights in the photos are. 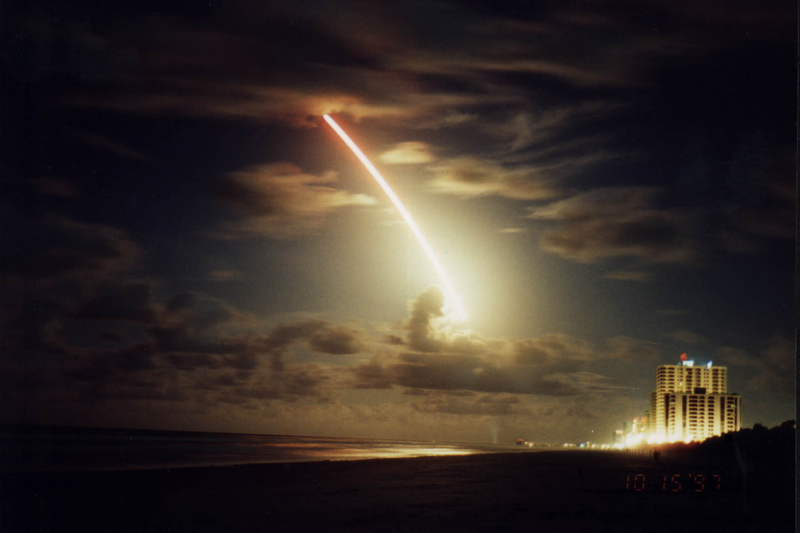 The exposures were long, ranging between 6 and 15 seconds, and I used a timer so as not to shake the camera during each exposure. Timing the shutter with the aircraft was tricky but I got a few good ones. Two of the brightest planets, Venus and Jupiter, appear very close together tonight. 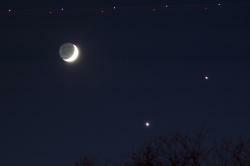 Tomorrow night (Dec 1) they will be joined by the crescent moon around 6 pm (CDT) to make an "unhappy face". "This is set to be the best planetary gathering of the year, simply because it involves three of the brightest objects in the sky after the sun," said Geza Gyuk, director of astronomy at the Adler Planetarium in Chicago. National Geographic. Fratricide on Jupiter: It’d be bloody, but everything’s red anyway. Are we next? : No. Definitely not.Courtesy NASAY’all know what “fratricide” is? It’s when a brother kills a brother. Or when a sister kills her brother. Or when a sister and a brother kill their brother. Any combination, really, involving a brother getting iced. Well, it has happened on Jupiter. A little brother has been torn apart by his giant siblings. And by giant, I mean many times the size of earth. The Great Red Spot is a huge hurricane-like storm on the surface of Jupiter. The storm has been spinning for several hundred years, and has a diameter about three times that of Earth. Also, it’s red. The spot happens to have a couple of little brothers, too, named Red Spot Jr. (or Oval Ba, if you can’t get your head around having a little brother that’s your “Jr.”) and the Little Red Spot. Or, I should say, it had a couple of little brothers. Now it has a little brother, and some spare brother chunks. You see, Great Red Spot, and Red Spot Jr. tore Little Red Spot to shreds last week. Officials are still baffled as to the motive, but what we know is this: LRS was strolling innocently through its neighborhood of Jupiter when it was ambushed from either side by GRS and RSJ. No weapons are thought to have been involved, ironically making the crime that much more brutal—the larger storms ripped their little brother apart with their own stormy hands, and when GRS and RSJ ran off, all that was left of LRS were sad little shreds. The proximity of the incident has complicated investigation, to say the least, but I have my own theories. Red Spot Junior, as it happens, only recently earned its title—it was not until only two years ago that it actually turned red. I think that RSJ may have been long overdue to prove itself as a true red spot. Both intimidated and protected by its larger brother, RSJ was content to allow GRS to be the planet’s muscle. Over the months, however, I guess that RSJ’s desire to prove itself intensified, or that GRS tired of doing its little brother’s dirty work. Either way, the two larger spots turned their sites towards their small brother, always the “simplest” of the three. I think it’s very likely that GRS provided cover and just watched while RSJ did the butcher’s work, but the blood doesn’t stand out on its recently acquired coloring. The red color of the spots, although no doubt symbolic of their bloodthirsty hearts, is not entirely understood. It’s thought that the color may come from material sucked from deep in the planet as the storms get stronger. Phosphorus-containing molecules, for instance would turn red when exposed to sunlight on the planet’s surface. Astronomers the world over are reeling from the violent act. Oval BA, or more commonly recognized as the Little Red Spot of Red Spot Jr., has captured some scientists’ attention. Still wondering what Oval BA is? It is a fierce storm on the planet Jupiter. Oval BA is the little “brother” to the well-known Great Red Spot on Jupiter. 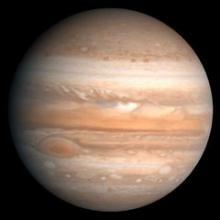 Jupiter is the fifth planet from the Sun and is the largest planet in our solar system. 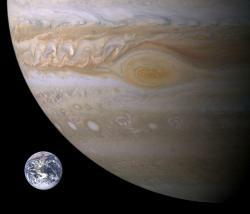 To give you an idea of how massive Jupiter is, one thousand planets the size of Earth could fit inside one Jupiter! 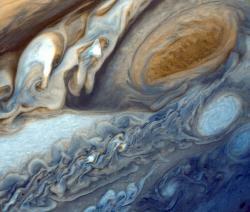 The Great Red Spot is a huge storm circulating counterclockwise in Jupiter’s atmosphere. Oval BA is about half the size of the Great Red Spot. Oval BA first appeared in 2000 when three smaller spots collided. What is going on with Oval BA? Recently the Hubble Space Telescope relayed information detailing Oval BA has changed and is becoming more like the Great Red Spot. A year ago, Oval BA was white. Currently it is a reddish hue matching that of its bigger counterpart. Oval BA has been clocked having 400 mile per hour winds. 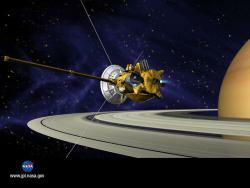 Scientists speculate the little red spot has gained speed as well as strength as it has shrunk. Amy Simon-Miller, NASA planetary scientist, explained Oval BA picked up steam in the same fashion spinning figure skaters accelerate when they move their arms closer to their core. The reddish hue can be attributed to red material in the atmosphere-mostly sulfur. Jupiter will be heading behind the sun out of Earth’s view until January. Scientists are expecting more noticeable changes when Jupiter comes back into view. Until then, what do you think will happen to these two distinct storms? Do you think there will be a day when Oval BA and the Great Red Spot collide and create one massive storm? Jupiter is growing spots. The largest planet in our solar system has long been home to the Great Red Spot, but recently a second red spot, not as large and dubbed ‘Red Spot, Jr.’ by astronomers, was seen to form on the face of Jupiter. Seen with the naked eye on a clear night, Jupiter, the largest planet in our Solar System, looks like a very bright star. But seen through a powerful telescope, the face of Jupiter crawls with ever-changing sworls of color. The biggest of these sworls is the Great Red Spot. It is an enormous storm, a hurricane three times larger than the entire Earth, which has been raging for over 300 years. 2nd Red Spot on Jupiter: Hubble Space Telescope Image courtesy of NASA. ‘Red Junior’ was first spotted by Christopher Go in February of this year. The new spot formed from the merger of three, smaller white spots sometime in the past year, and then turned red, just like its larger cousin. 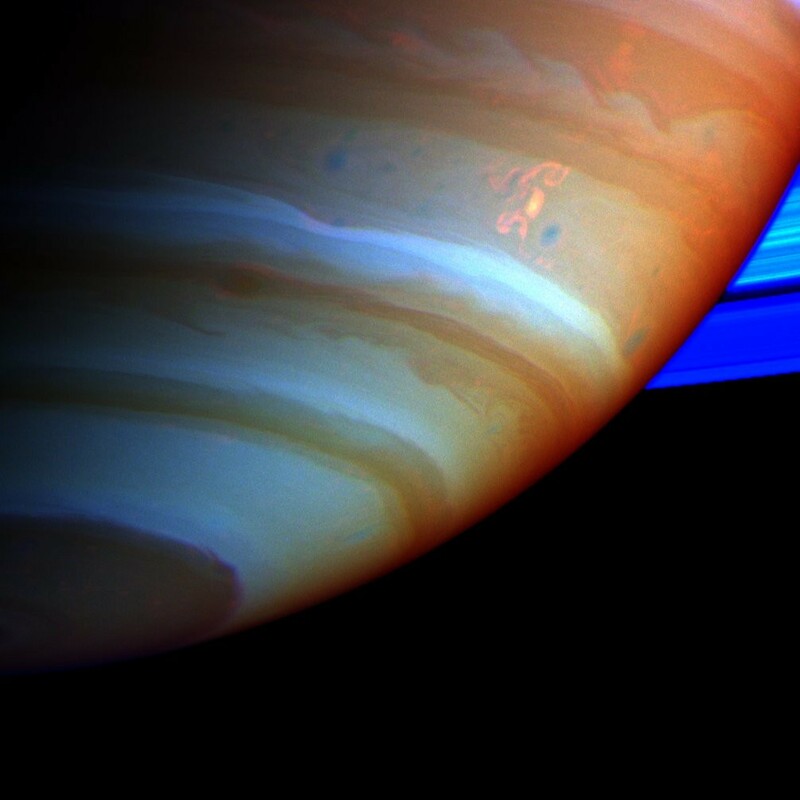 The picture here is courtesy of the Hubble Space Telescope. The Great Red Spot has been know almost as long as telescopes have been around. It was first seen by the Italian astronomer Giovanni Cassini sometime around 1665 and has been an object of fascination and study ever since. No one is exactly sure why it has its reddish color, although one theory is that the storm dredges up gas from deep inside Jupiter and brings it to the surface where it reacts with the sunlight and turns red. Unlike Earth, which is made of rock surrounded by a thin atmosphere, Jupiter is almost entirely made of gasses. This lack of a rocky core means that there is nothing to slow down or stop violent storms once they get started. They just continue to swirl and combine with each other. 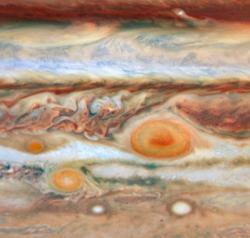 Everything on the face of Jupiter changes except the Great Red Spot; it is an island of stability in a sea of chaos. The appearance of a second spot has prompted some astronomers to speculate that Jupiter is undergoing a change in climate. No one is sure what will happen to Red Junior. It is possible that it will die out, or break up into smaller storms, or even merge with the bigger Spot. Astronomers will be keeping a close eye on it to find out what happens next.